If you’re eating gluten-free and have been craving your favorite childhood breakfast, I have good news for you. 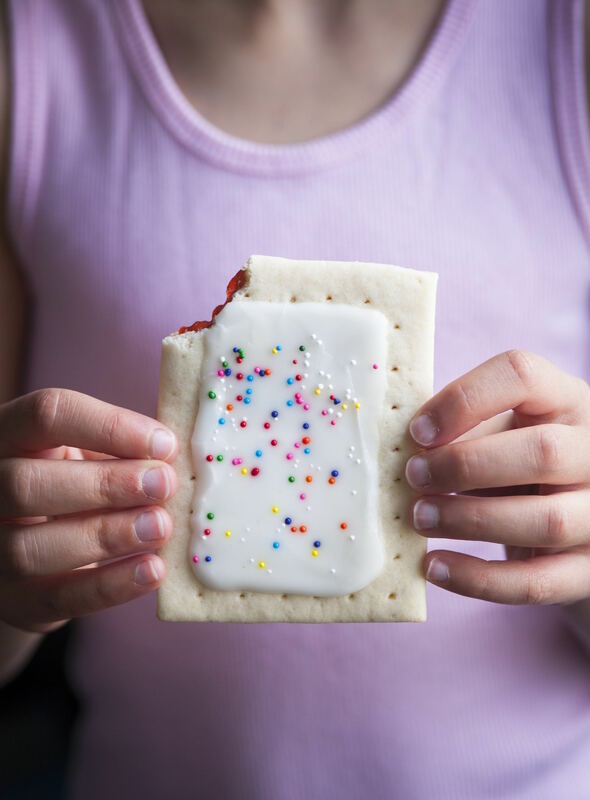 These copycat strawberry Pop-Tarts look a whole lot better than the packaged version, and they’re gluten-free. As a matter of fact, Nicole Hunn, author of Gluten-Free Classic Snacks: 100 Recipes for the Brand-Name Treats You Love, has managed to make a ton of your favorite eats gluten free, and they all look pretty darn tasty to me. Prepare the crust: Heat your oven to 350 degrees F. Line a large rimmed baking sheet with unbleached parchment paper, and set it aside. In a large bowl, place the flour, cornstarch, salt and sugar, and whisk to combine well. Create a well in the center of the dry ingredients, and add the butter, vanilla, egg and 2 fluid ounces of the milk, mixing to combine after each addition. The dough will be thick. Knead the dough with your hands until it is smooth, adding more milk by the half-teaspoonful as necessary to bring the dough together. Place the dough on a lightly floured surface, and dust lightly with flour to prevent the dough from sticking to the rolling pin. Roll out the dough 1/4 inch thick, and slice it into as many 3-1/2 x 4-1/2-inch rectangles as possible (it should be at least 24 rectangles). If the dough becomes difficult to handle at any point, wrap it in plastic wrap, and place it in the freezer to chill briefly. Place 1 tablespoon of strawberry jelly on the centers of the half rectangles of dough, and spread into an even layer, leaving a 3/4-inch border clean on all sides of the rectangles. Cover with the remaining rectangles of dough, and press all around the clean edges to seal. Using a sharp knife or pastry or pasta wheel, cut off about 1/2 inch of dough around all sides of the pastries. Place the pastries about 2 inches apart from one another on the prepared baking sheet. Dock the pastries by piercing randomly on top with a toothpick or wooden skewer. Place the baking sheet in the center of the oven, and bake until the pastries are very lightly golden brown around the edges and just set in the center, about 8 minutes. Remove from the oven, and allow to cool on the baking sheet for 10 minutes before transferring to the wire rack to cool completely. While the pastries are cooling, prepare the glaze: In a medium-size bowl, place the confectioners’ sugar and 1 tablespoon of water, and mix until combined in a thick paste. Add more water by the half-teaspoonful as necessary to create a thickly pourable glaze. 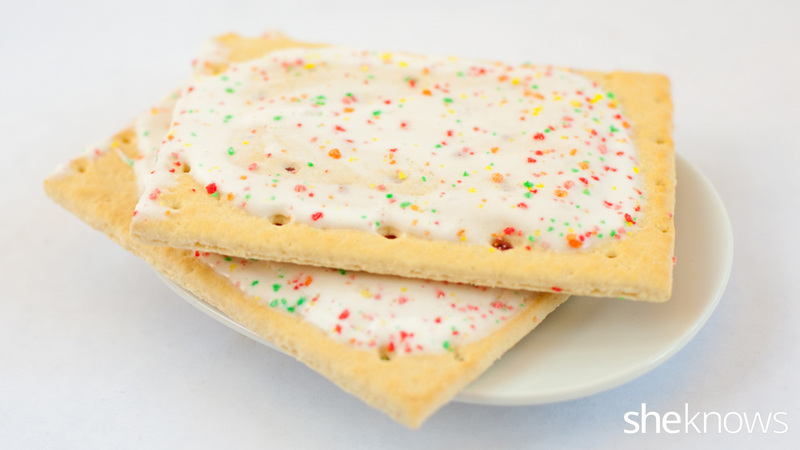 Spread the glaze thickly on top of each cooled pastry, and sprinkle lightly with nonpareils. Allow to set at room temperature before serving. The finished pastries can be stored in a sealed glass container at room temperature and should maintain their texture for at least 3 days. For longer storage, wrap individually in freezer-safe wrap, and freeze for up to 2 months. Defrost at room temperature, or unwrap and defrost in the toaster. From the book Gluten-Free Classic Snacks: 100 Recipes for the Brand-Name Treats You Love by Nicole Hunn. Excerpted by arrangement with Da Capo Lifelong, a member of Perseus Books Group. Copyright (c) 2015. About the book: The phrase “gluten-free” carries many connotations. Expensive. Tasteless. Limiting. Some are forced to adapt to a gluten-free lifestyle due to health reasons, while others enter into it willingly and enthusiastically. Whether gluten-free by choice or constraint, Nicole Hunn’s latest book in the Gluten-Free on a Shoestring series is a valuable resource to anyone longing for a way to enjoy their favorite brand-name snacks — minus the gluten! 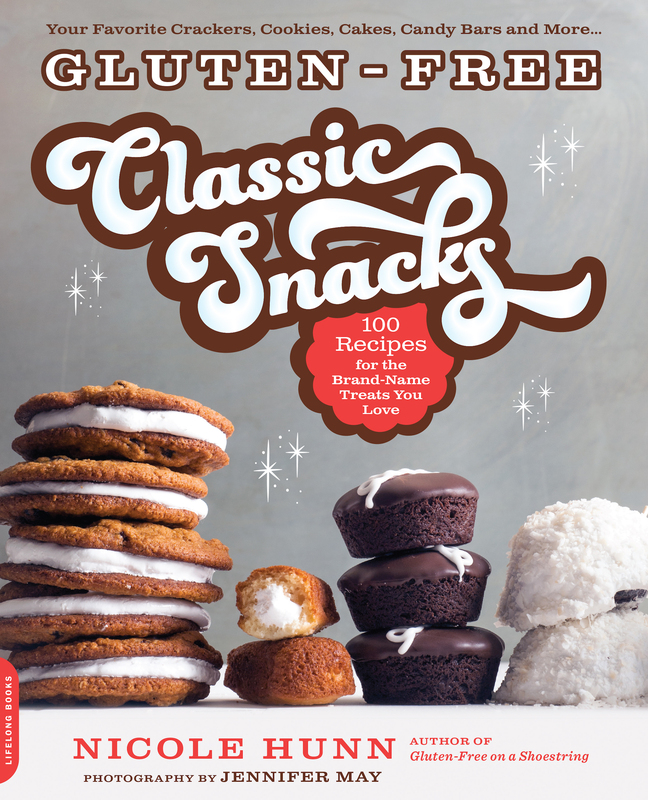 In Gluten-Free Classic Snacks: 100 Recipes for the Brand-Name Treats You Love, Nicole Hunn enables readers to enjoy beloved flavors and favorite treats that would otherwise be off-limits. From Girl Scout cookies to Hostess Twinkies, Hunn walks bakers through each recipe with simplicity. In addition to providing delectable recipes, Hunn educates her fellow gluten-free bakers about the various types of gluten-free flour blends and her favorite brands of gluten-free baking necessities. Also included is a list of substitutes for those with further dietary restrictions. Hunn lets bakers in on her personal tips and tricks, from preparation to finishing touches. Among her recipes are the classics seen in grocery stores all over the country. Nicole Hunn is the author of the Gluten-Free on a Shoestring series and blog, which has been featured in the The New York Times and MSN Money. She lives in Westchester County, New York.